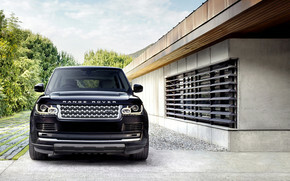 Our First Class – Deluxe SUV is the powerful and luxurious Range Rover Vogue. This vehicle is a statement in itself. With a powerful presence on the road and designed for comfort on the inside choose our First Class – Deluxe SUV chauffeur service for a ride in our Range Rover Vogue. Power, presence and innovation combined in one vehicle to give a First Class deluxe service. Use this service for the ultimate level of comfort. Heated seats, touch screens, panoramic roof and massaging seats, this level of comfort comes with our Range Rover Vogues. Allow yourself to be driven with our Deluxe SUV.